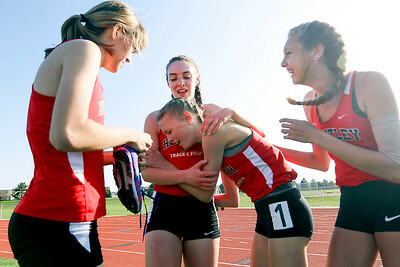 Sarah Nader- snader@shawmedia.com Huntley's Kiera Daly collapses after competing in the 4x800 meter relay final at Friday's McHenry County track meet at Huntley High School April 22, 2016. The Huntley relay team set a meet record of 9:42.9 in the 4x800. Sarah Nader- snader@shawmedia.com Huntley's Kate Mitchell (left), Kiera Daily, Mary Raclawski and Chloe Smith celebrate after competing in the 4x800 meter relay final at Friday's McHenry County track meet at Huntley High School April 22, 2016. The Huntley relay team set a meet record of 9:42.9 in the 4x800. 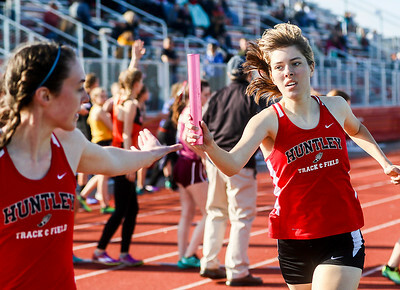 Sarah Nader- snader@shawmedia.com Huntley's Kiera Daily (left) take the baton from Kate Mitchell while competing in the 4x800 meter relay final at Friday's McHenry County track meet at Huntley High School April 22, 2016. The Huntley relay team set a meet record of 9:42.9 in the 4x800. 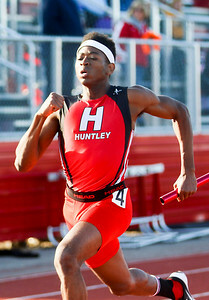 Sarah Nader- snader@shawmedia.com Huntley's Jeremie Allen competed in the 4x100 meter relay final at Friday's McHenry County track meet at Huntley High School April 22, 2016. 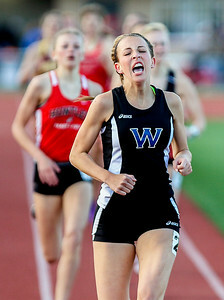 Sarah Nader- snader@shawmedia.com Woodstock's Grace Beattie finishes ahead of the pack while competing in the 800 meter run final at Friday's McHenry County track meet at Huntley High School April 22, 2016. 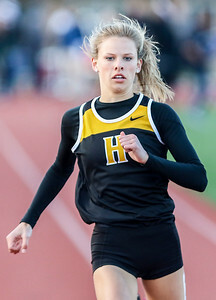 Sarah Nader- snader@shawmedia.com Harvard's Sophie Stricker competes in the 100 meter dash final at Friday's McHenry County track meet at Huntley High School April 22, 2016. 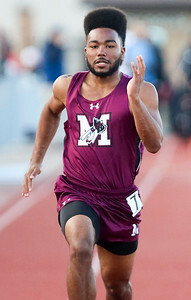 Sarah Nader- snader@shawmedia.com Marengo's Jarren Jackson competes in the 100 meter dash final at Friday's McHenry County track meet at Huntley High School April 22, 2016. Sarah Nader- snader@shawmedia.com Crystal Lake South's Emma Heuck compete in the 800 meter run at Friday's McHenry County track meet at Huntley High School April 22, 2016. 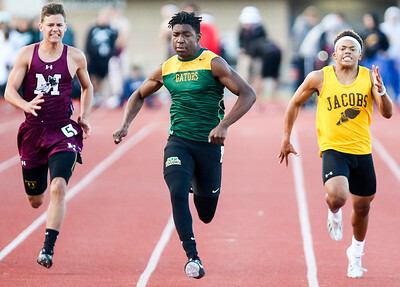 Sarah Nader- snader@shawmedia.com Marengo's Michael Anderson (left) Crystal Lake South's Will Lawrence and Jacobs' Ersom Trejo compete in the 100 meter dash final at Friday's McHenry County track meet at Huntley High School April 22, 2016. 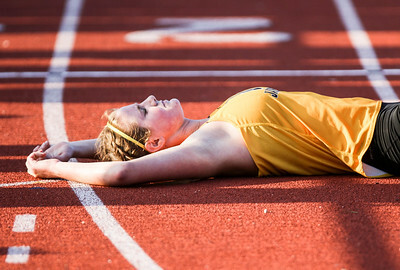 Sarah Nader- snader@shawmedia.com Jacobs' Alex Lorenz collapses after competing in the 3200 meter run final at Friday's McHenry County track meet at Huntley High School April 22, 2016. 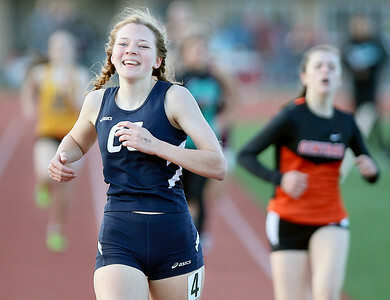 Sarah Nader- snader@shawmedia.com Cary-Grove's Linnea Yokup competes in the 800 meter run at Friday's McHenry County track meet at Huntley High School April 22, 2016. 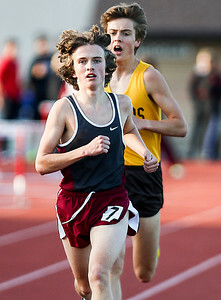 Sarah Nader- snader@shawmedia.com Prairie Ridge's Mike Ostrow (left) and Jacobs Garrett Brenizer compete in the 3200 run final at Friday's McHenry County track meet at Huntley High School April 22, 2016. 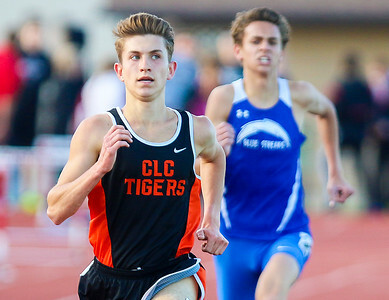 Sarah Nader- snader@shawmedia.com Crystal Lake Central's Cole Barkocy (left) is followed by Woodstock's Luke Beattie while competing in the 3200 meter run final at Friday's McHenry County track meet at Huntley High School April 22, 2016. 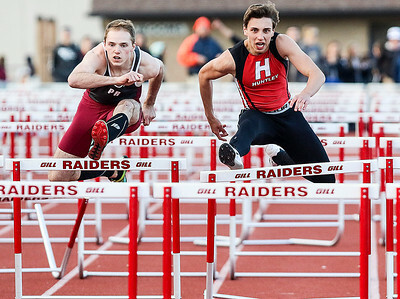 Sarah Nader- snader@shawmedia.com Prairie Ridge's Dylan Dwyer (left) Huntley's Lukas Bolas compete in the 110 meter hurdles final at Friday's McHenry County track meet at Huntley High School April 22, 2016. 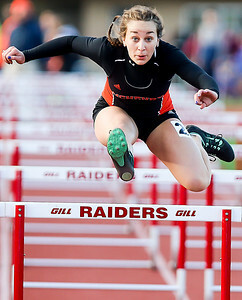 Sarah Nader- snader@shawmedia.com McHenry's Macy Glosson compete in the 100 meter hurdles final at Friday's McHenry County track meet at Huntley High School April 22, 2016. 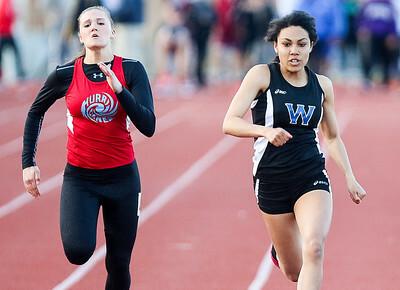 Sarah Nader- snader@shawmedia.com Marian Central's Brenna Koch (left) Woodstock's Briana Verbeeck compete in the 100 meter dash at Friday's McHenry County track meet at Huntley High School April 22, 2016. 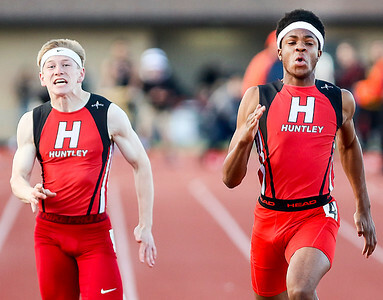 Sarah Nader- snader@shawmedia.com Huntley's Ben Marsh (left) and Dubem Anikamadu compete in the 100 meter dash final at Friday's McHenry County track meet at Huntley High School April 22, 2016. 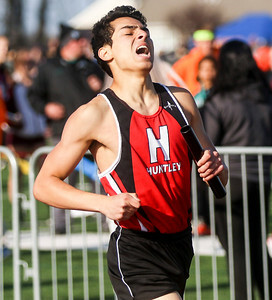 Sarah Nader- snader@shawmedia.com Huntley's Zach Hollman competes in the 4X800 relay final at Friday's McHenry County track meet at Huntley High School April 22, 2016. 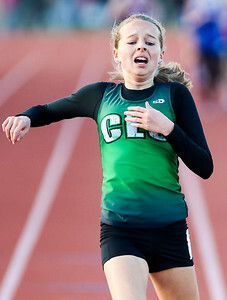 Crystal Lake South's Emma Heuck compete in the 800 meter run at Friday's McHenry County track meet at Huntley High School April 22, 2016.